From the 1945 aerial image it's easier to explain Penwyneiddan farm's position. The farm was situated between the bend of Corporation Road on the left and the Queensway on the right, during the development of Fforestfach Industrial Estate Swansea. The end of farm possibly came as a compulsory purchase order of the land by Swansea Council. The area was needed for light industry development and job creation after WWII.. The oldest map I have of the area, you can see how the names have changed. 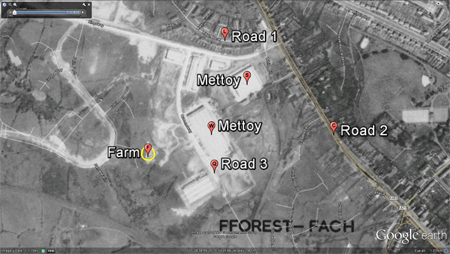 Early Fforestfach Industrial Estate, showing only a few buildings. The farm is on the left with Cockett G.W.R. goods yard branch line on the right with the old Greyhound track in-between, latter built off Ystrad Road. The most recent satellite view. Pen llwyn eithen is connected to the underlined Carmarthen Road. The farm's is also connected on its north west access to related farm called Pen llwyn eithin fach which had a track leading Ystrad Road near Ystrad uchaf. This related farm name isn’t seen on later maps, as its name changes to Felin-fach. Payable to vicar 15 shillings, Payable to Sir John Morris Baronet £1.10.00. While comparing both Tithe Map and the OS 1805-1879, I found Penllwn Ithan ycha fields were next to Raven Hill farm bottom fields; there is more room for further investigation between the the Tithe map and its relevant Apportionment of 1843. Access: (Main) North East route between Worcester and Wig fach collieries, over at least 3 railway lines onto what is now White City Road (2012) leading to Carmarthen Road. Directions: roughly 500 meters North West from small bridge at Cockett. 2nd access runs North West into a place called Felin-fach this is north east of Ystrad Road and North West of Cwmbach colliery, Felin fach is off the Kingsway and the road leading to recently developed area that leads onto Corporation Road. West of old mineral railway to Worcester /Wig-fach Collieries, north of Cwmbach colliery and Cockett railway line. 1899 OS Map Penderry PH. - Pen-llwyn-eithin Uchaf. Now has 6 Buildings, north west of Cwmbach Brick Works. 1916 OS Map Penderry PH. - Pen-llwyn-eithin Uchaf. 6 Buildings and a few changes from map, No brick works nearby. 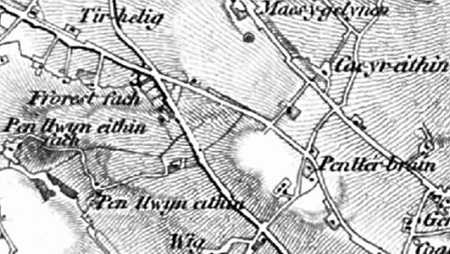 1940 OS Map – Pen-llwyn-eithin Uchaf. Many Buildings shown on map above, the farm is at its largest. West of what looks like a greyhound track as mentioned by Haydn Williams in his audio interview. GWR railway line, timber Yard connected to mainline railway at Cockett, where brick works used to be. 1950-55 OS Map - no name. No farm description and only a few buildings left, no evidence of track, Industrial park built including Queensway road with two Mettoy buildings, the expanding Industrial estate is encroaching on the farm land. Only part of the railway that was GWR shown, at the bottom near the railway where the Cwmbach works were is now a saw mill. 1964 OS Map - no name. 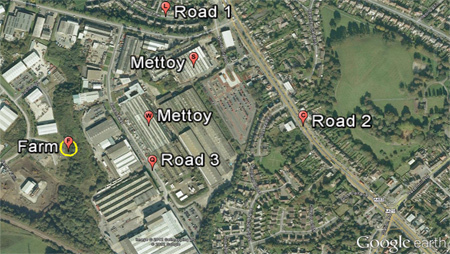 The farm and buildings have now disappeared, more factories on west side of Queensway. The GWR railway junction at Cwmbach Cockett with a mill described at centre of this junction. (1845) Page 81, Parish of Swansea Higher. (1869) (a) Swansea Polling District, The Hamlet of Swansea Higher. Voters in respect of Property, including Tenant Occupiers at a Rent of £50 and upwards. (1869) (b) Swansea Polling District, The Hamlet of Swansea Higher. In 1871 William was still living at home age 24 - could he possibly have been given or rented some farmland nearby? By 1881 Llewelyn (the younger) was the only child still living at home. I had understood that the farm was sold by my great grandmother at some point but as the land was rented I presume that couldn't have been the case. By 1901 Mary Williams was living at Nyddan Villa so the farm must have left the family between 1901 and 1911. In some census returns Llewelyn is written Lewlyn. Mary Williams (nee Morgan) was the daughter of Mary and William Morgan who ran the Post Office and Grocery store on Carmarthen Road in Fforestfach from about 1860. Llewelyn died in 1906 aged 46 and I understood that his wife Mary carried on running the farm but I don't know for how long. I am the great granddaughter of Llewelyn and Mary Williams. The word Pen-llwyn-eithin is spelt a number of ways on this page, all taken from orginal print. Maps - West Glamorgan Archive Service and Swansea library and http://www.old-maps.co.uk/maps.html.